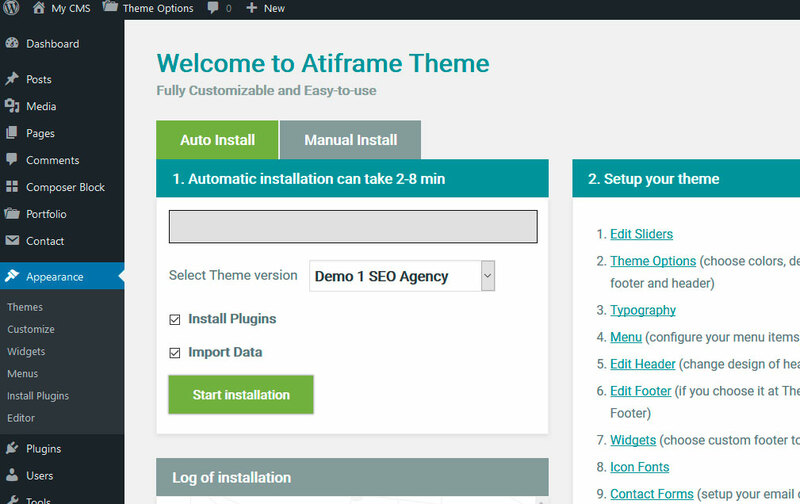 The documentation is intended to help you to install and setup Atiframe theme. If you have any problems, please send us ticket and we'll help you troubleshoot and solve the issue! 2. 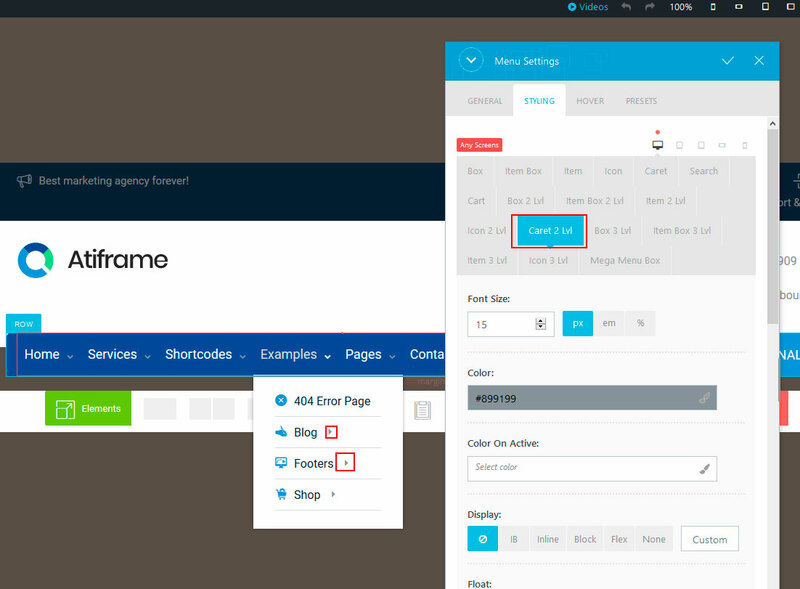 Unzip archive atiframe-installable.zip and upload it into your WordPress Theme directory /wp-content/themes/. 4. 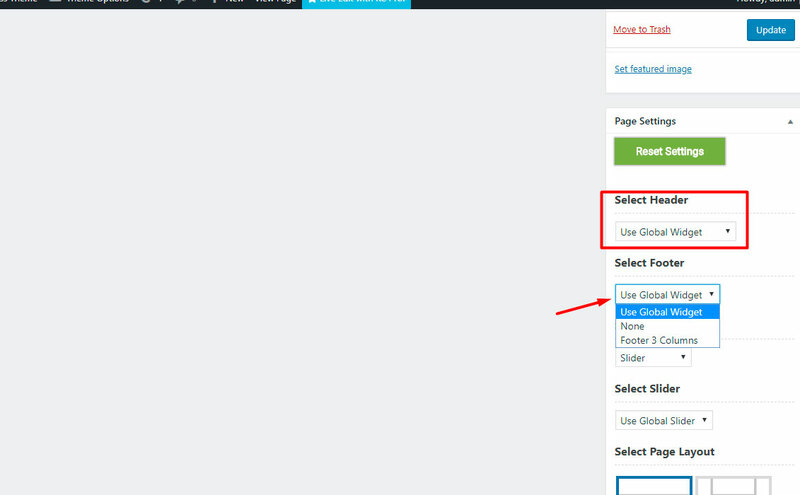 Click on the choose file button, select "atiframe-installable.zip" and click Open, and than Install Now button. 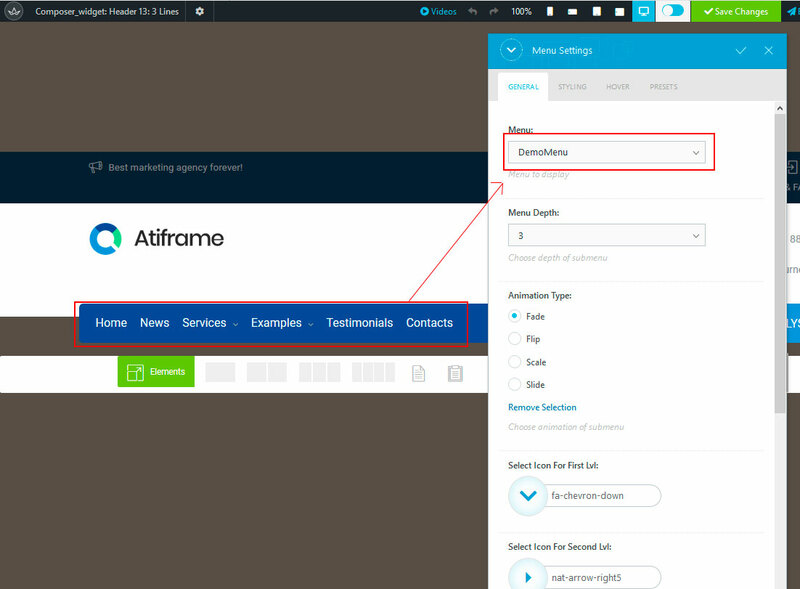 On the Appearance -> Atiframe page, choose version of design that you want to install and click Start installation button. 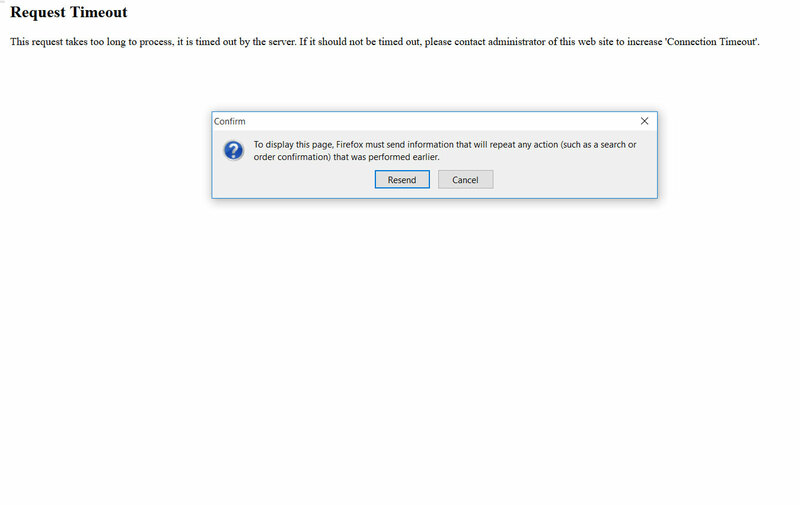 If you cannot finished automatic installation and got any server errors, you can use manual installation. There are step-by-step installation functions - just click and wait. There are 6 steps. 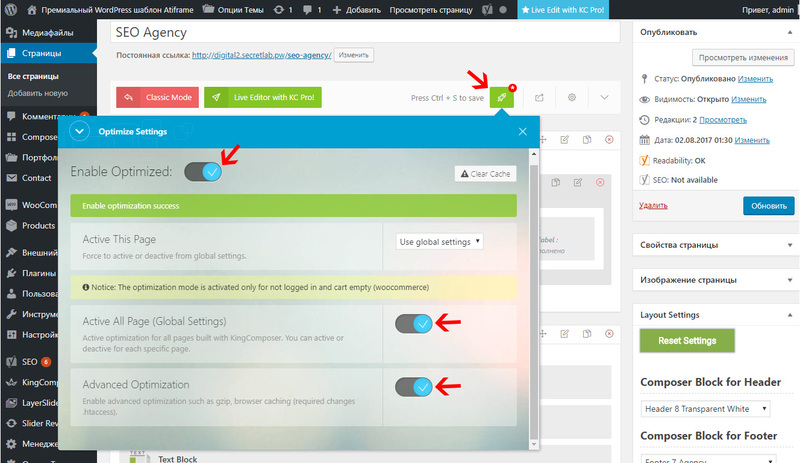 Every step can be done automatically by button Do it or manually by link (if it couln't be done automatically). 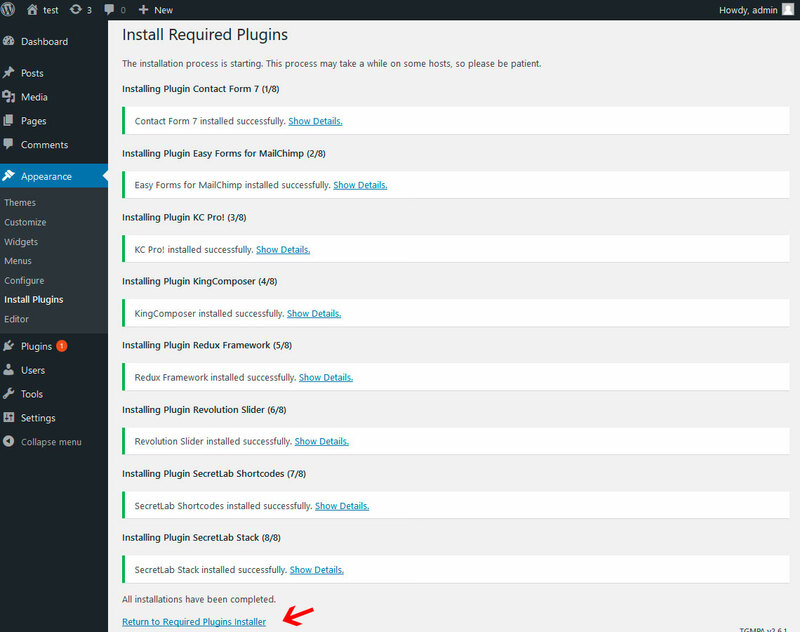 Files for full manual installation is contain at folder /atiframe/import/. 4. Click 4. 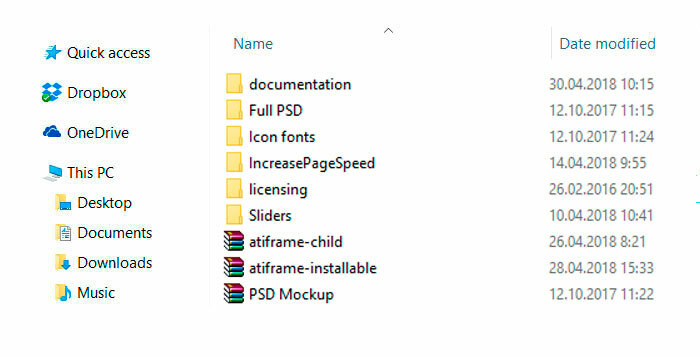 Import Sliders on Atiframe page. Click Import Slider on the screen that comes up. 5. Click 5. 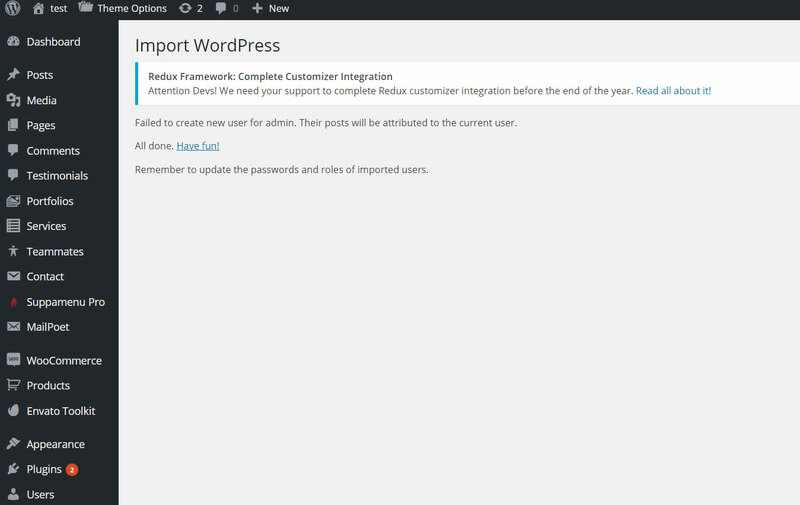 Import Theme Option Set on Atiframe page. 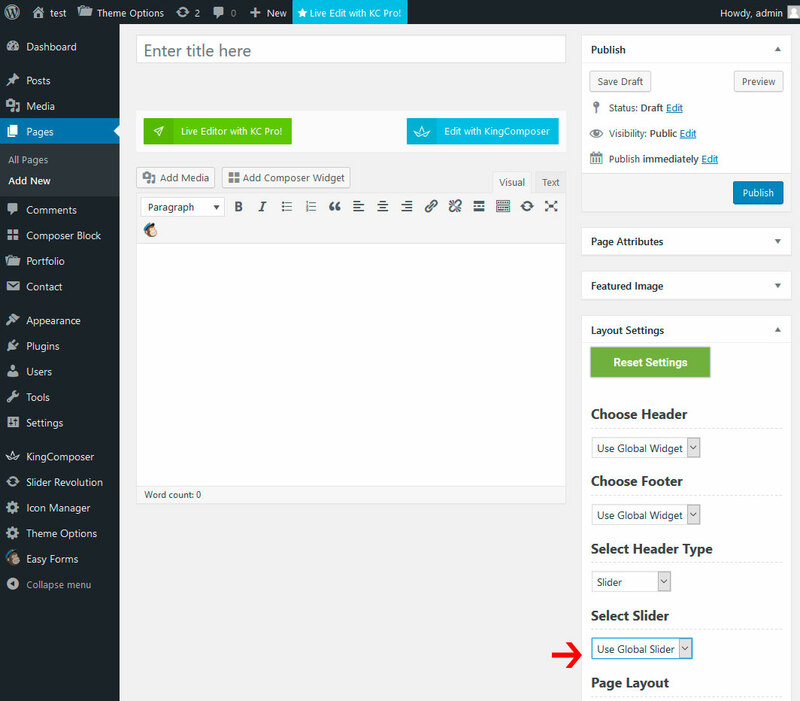 Open file with theme option settings in the /import/name_of_design/ folder. For example, /import/name_of_design/theme-options.json. 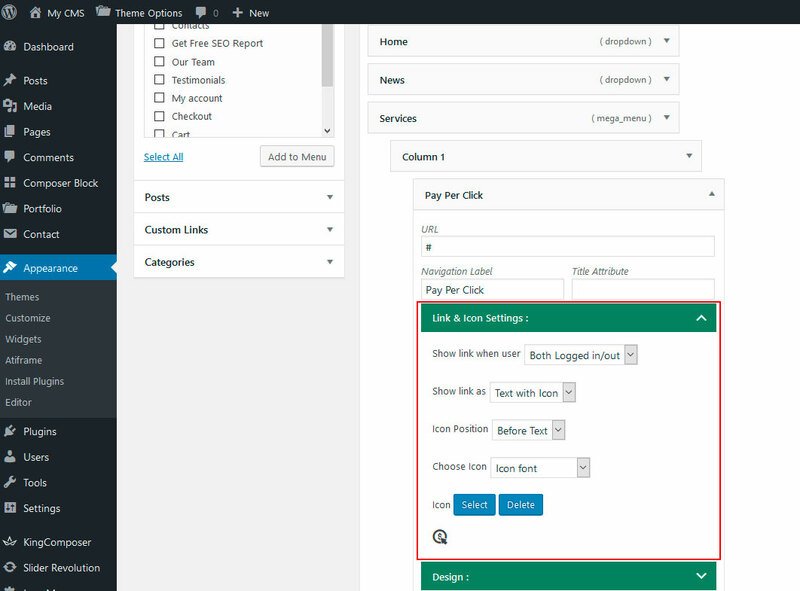 Copy all text data, click button import from file, paste the data into the textarea, and click Importbutton. 7. Click 7. 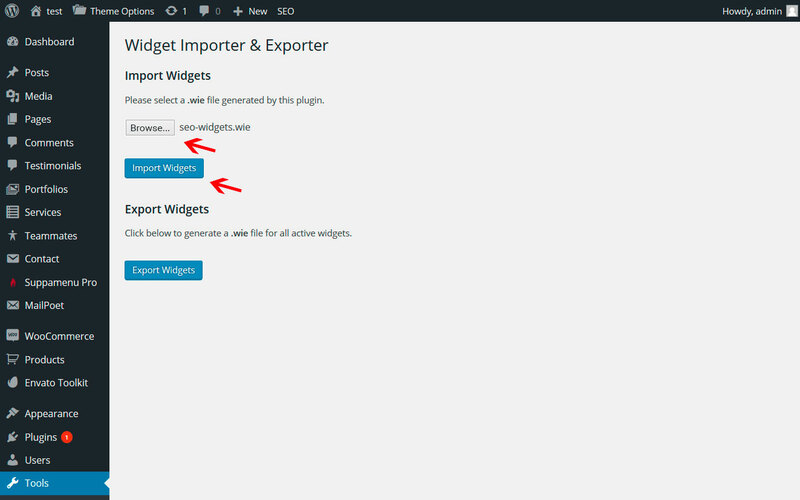 Import Widgets, choose file with widgets - widgets.wie file and click Import Widgets. 1. 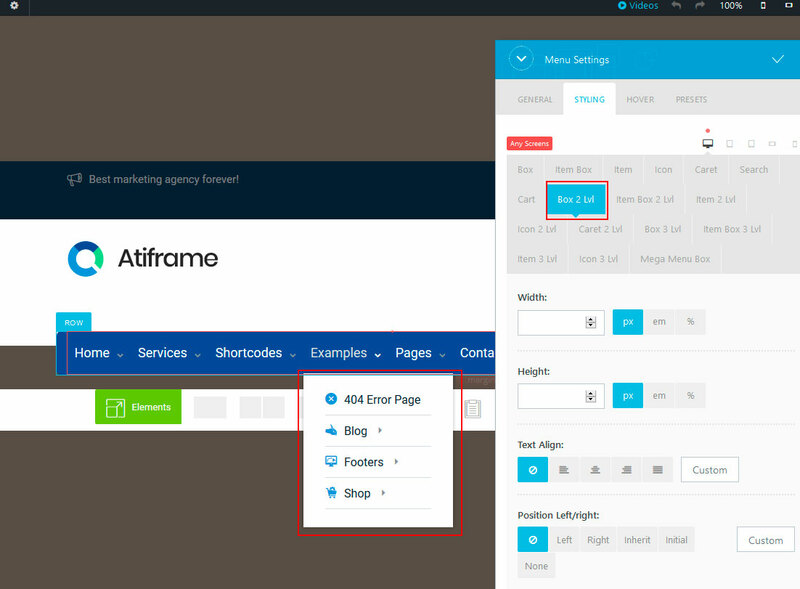 Update by Update tab on Atiframe page. 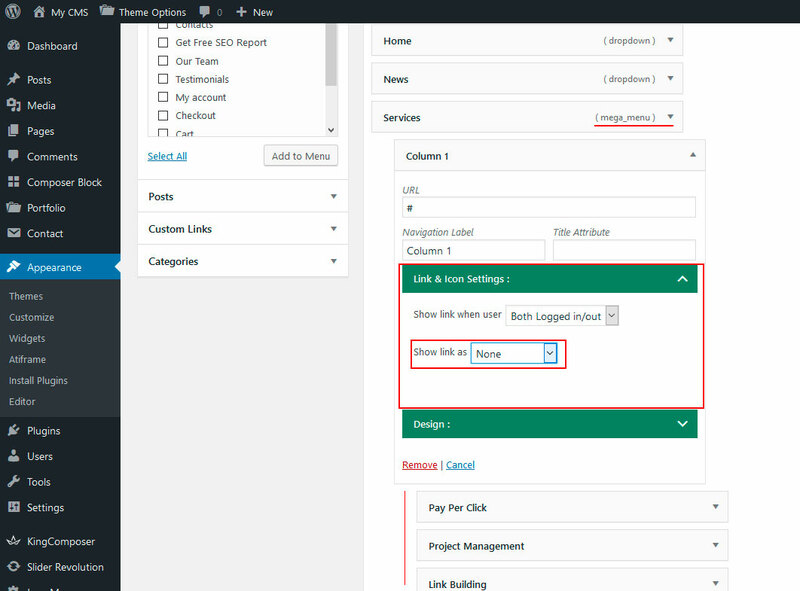 - Make token and set in to the token field. 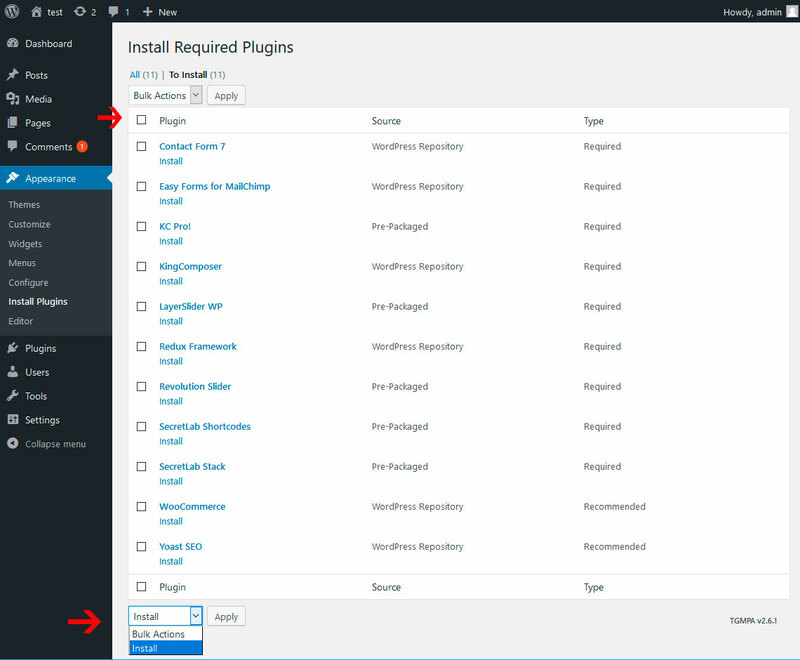 - After theme update, deactivate and and delete plugins Layer Slider, Revolution Slider, SecretLab Shortcodes, SecretLab Stack, King Composer, KC Pro and install it via yellow message at the top of admin page. The message appear when you delete some required plugins. 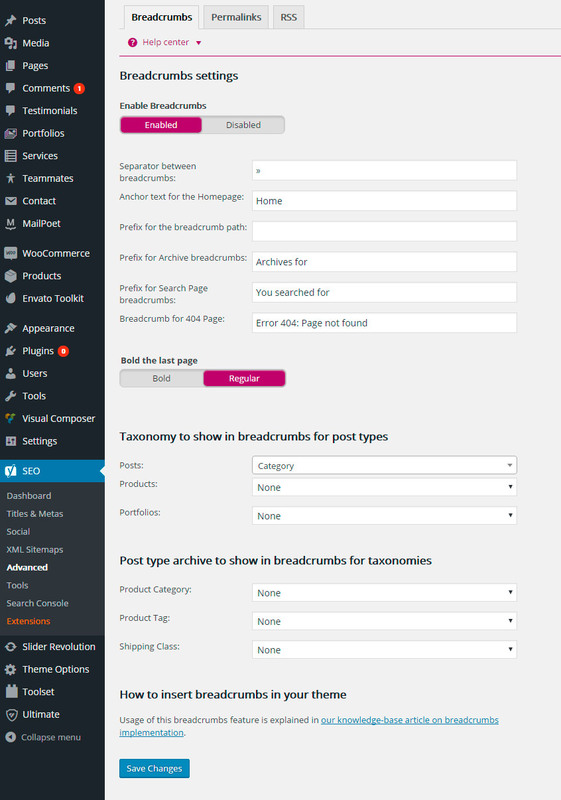 - Download installable archive with theme from ThemeForest. - Upzip atiframe-installable.zip on you computer and unpack it. 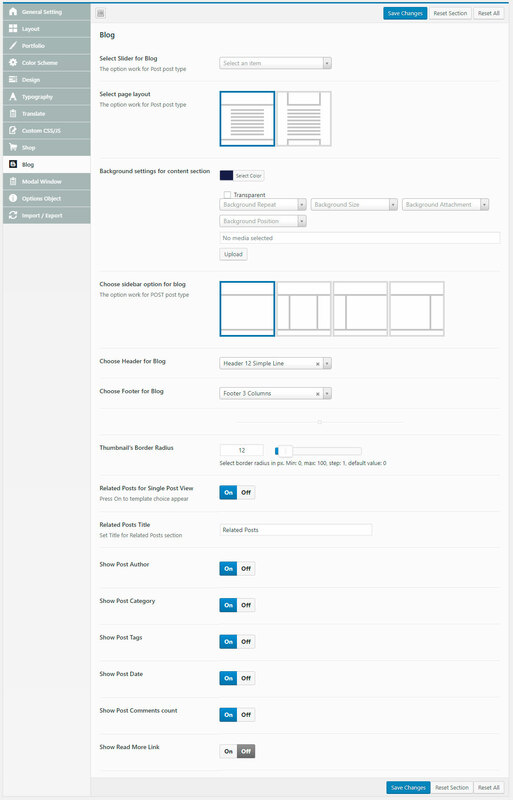 - Upload /atiframe/ folder at your hosting by ftp into /wp-content/themes/ folder. And say "Yes, replace all files". 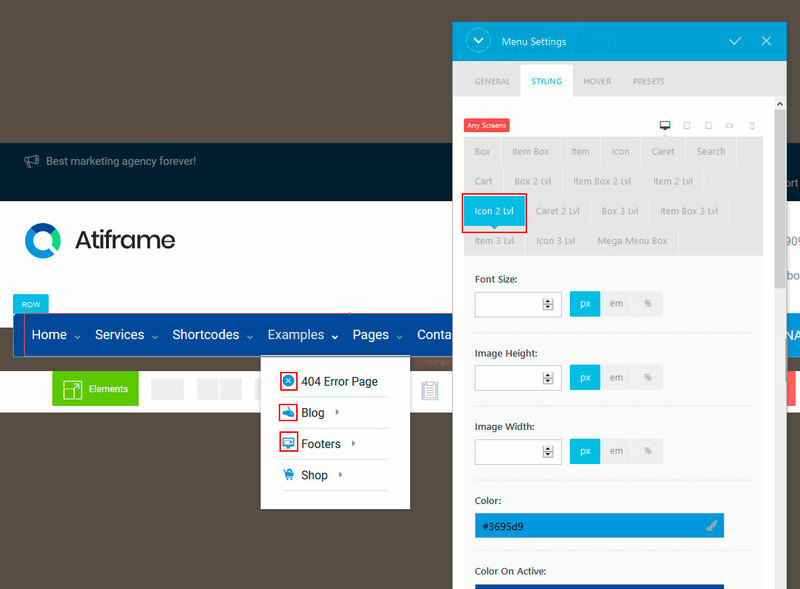 - Update plugins from folder /atiframe/lib/. 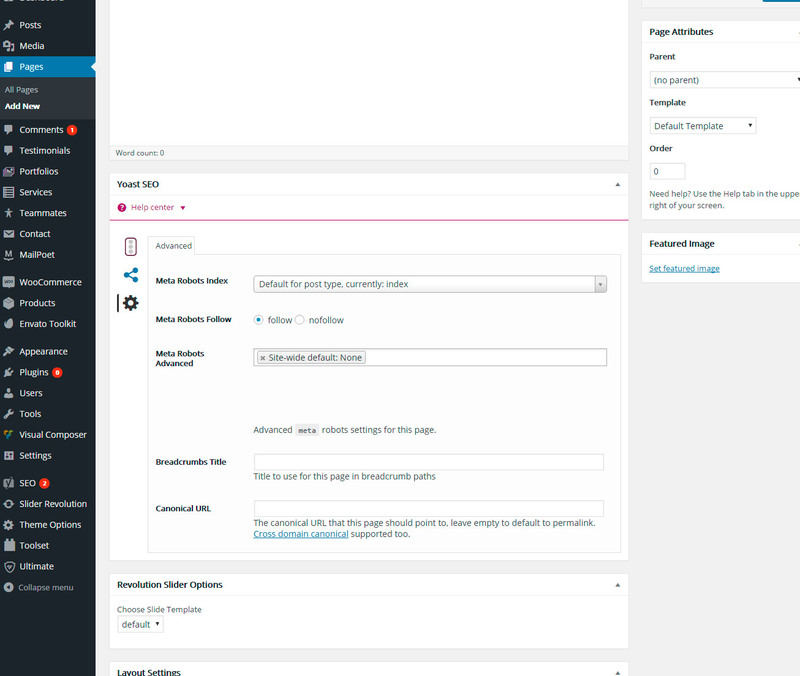 You need to update Layer Slider, Revolution Slider, SecretLab Shortcodes, SecretLab Stack, King Composer, KC Pro. 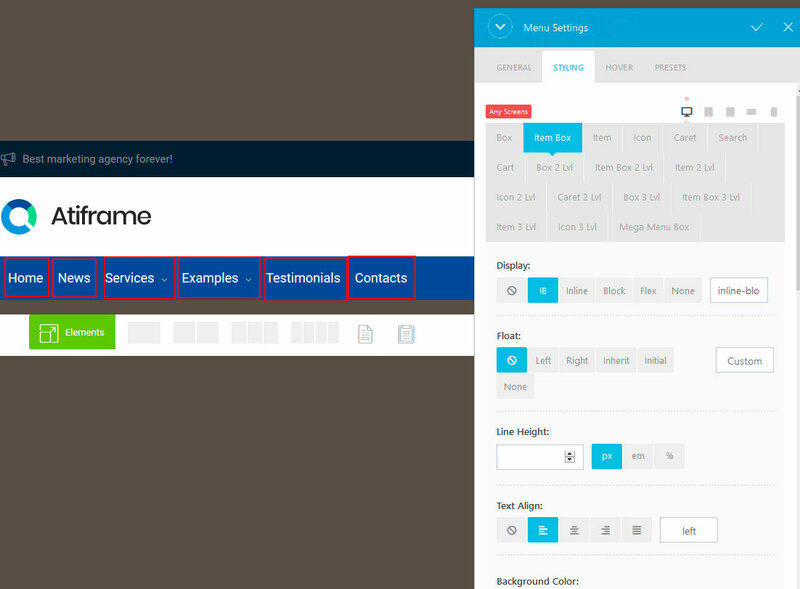 Update plugins Layer Slider, Revolution Slider, SecretLab Shortcodes, SecretLab Stack, King Composer, KC Pro. 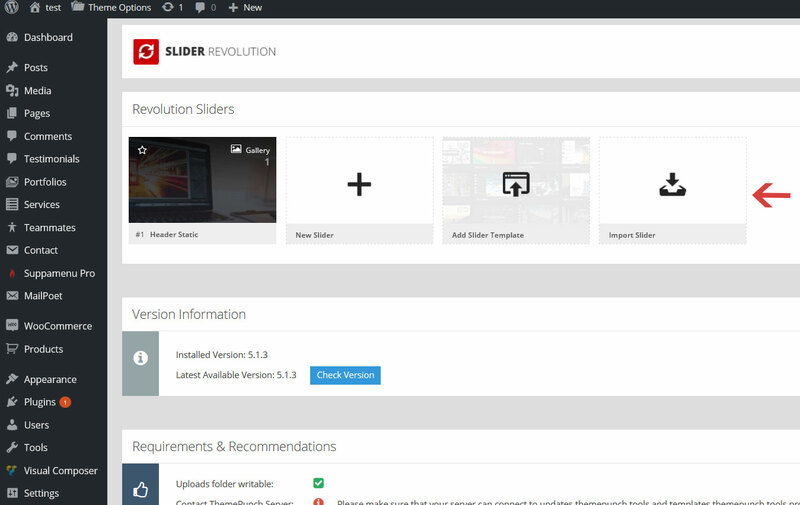 We bought developer extended licenses for Layer Slider and Slider Revolution. 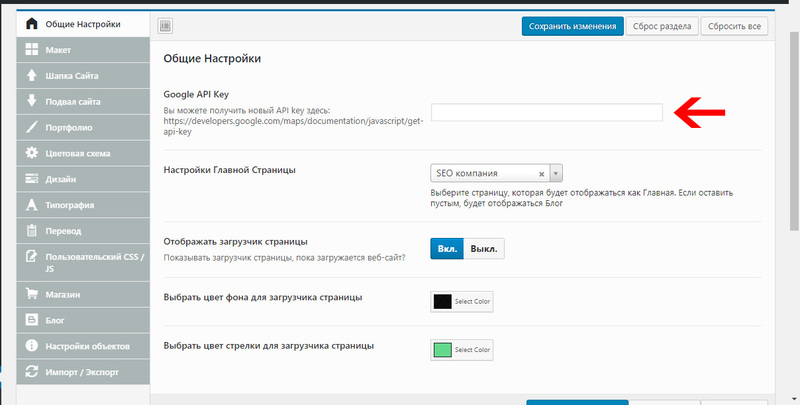 We must not share these keys (we have no permission to do it) - we provide updates of plugins with update of the theme. 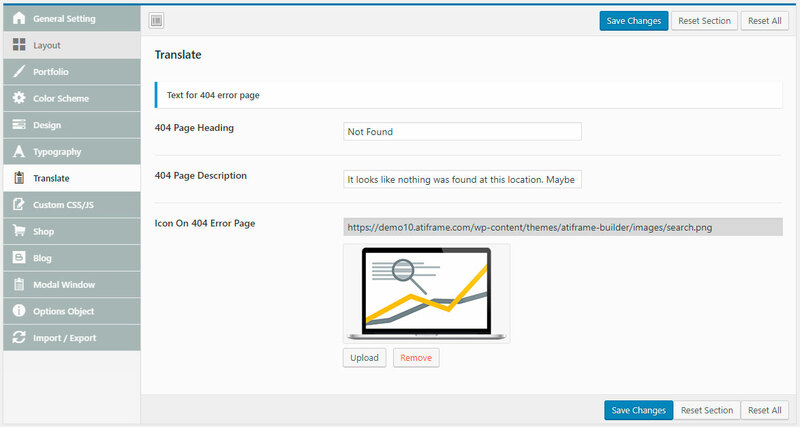 You will get updates of plugins with theme update. 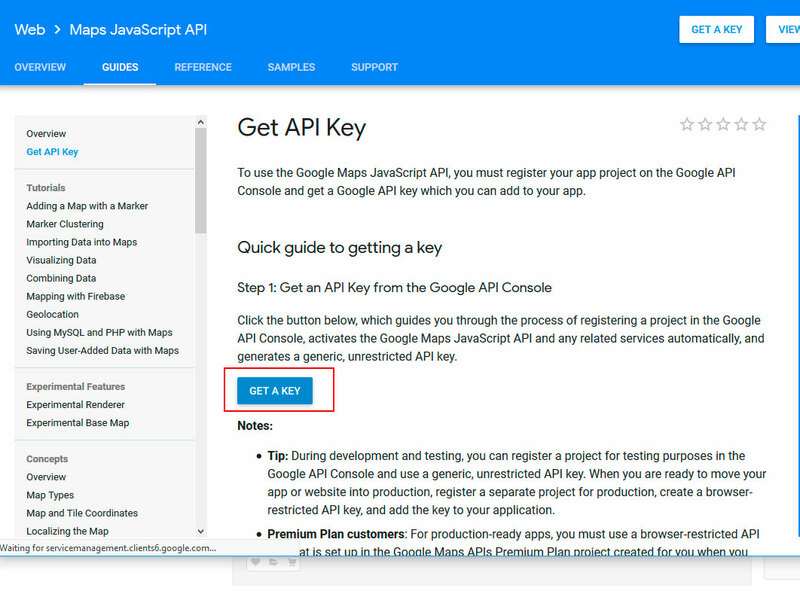 You can set your Google Map API key, choose your home page and configure page loader. 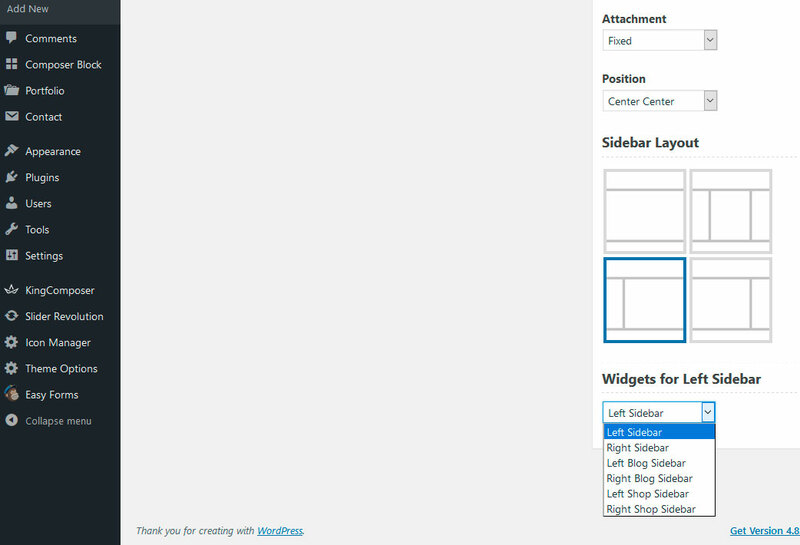 On the Layout tab, you can set transition time for hover effects, choose page layout and sidebar options. 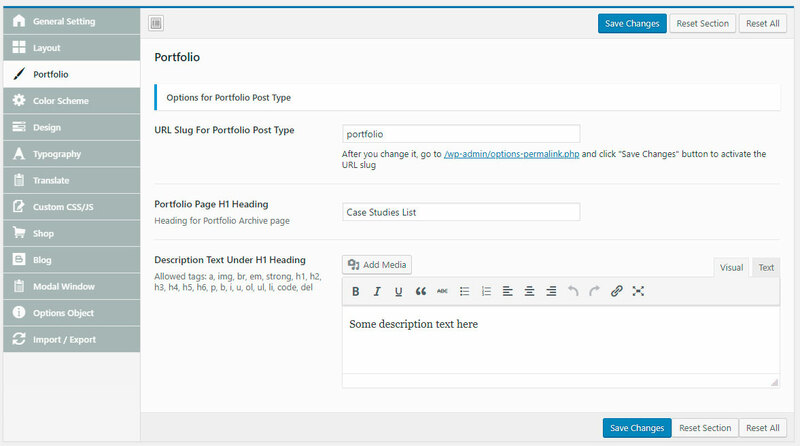 On the Portfolio tab, you can set slug and heading with description for portfolio archive page. You can edit colors of the design. Also you can load presets of colors. 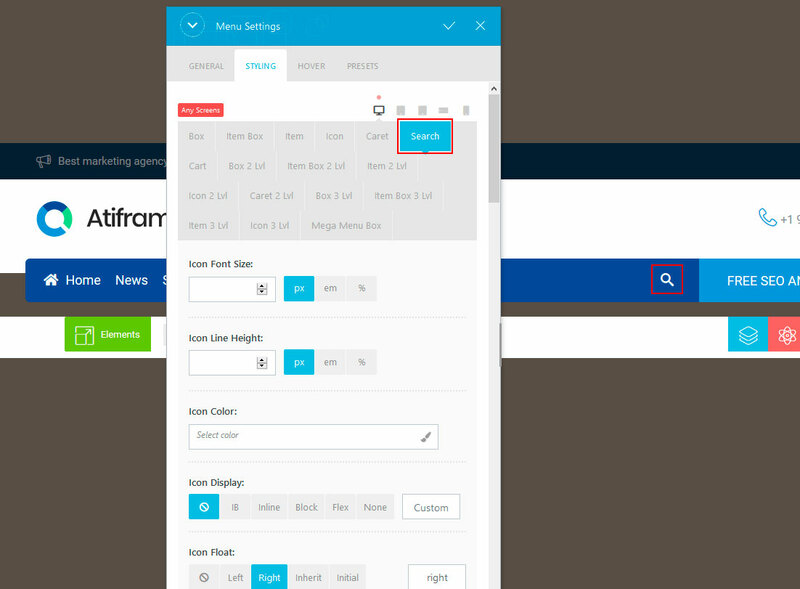 Options sidebar, buttons and inputs. Padding for boxed background. On the Translate tab, you can write text for 404 error page. 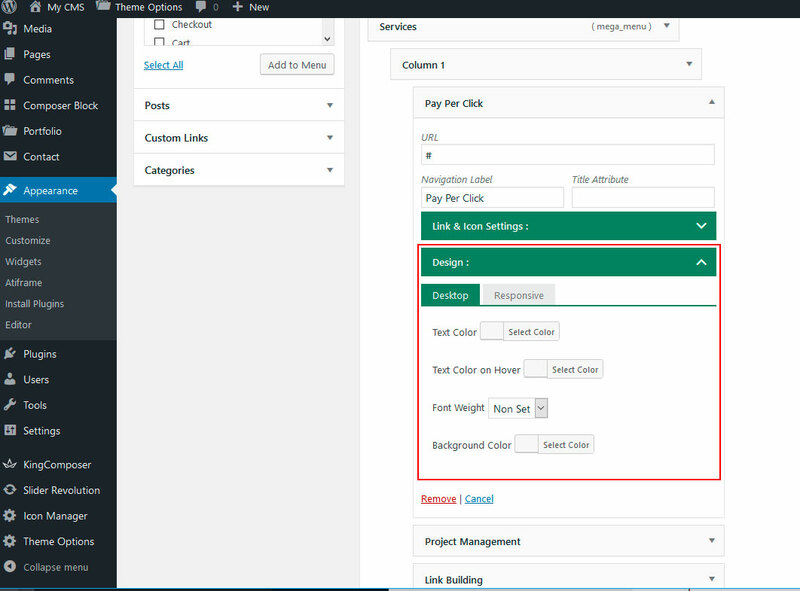 On the Custom CSS/JS tab, you can add any custom CSS and JS code and turn off the Scroll to top button. 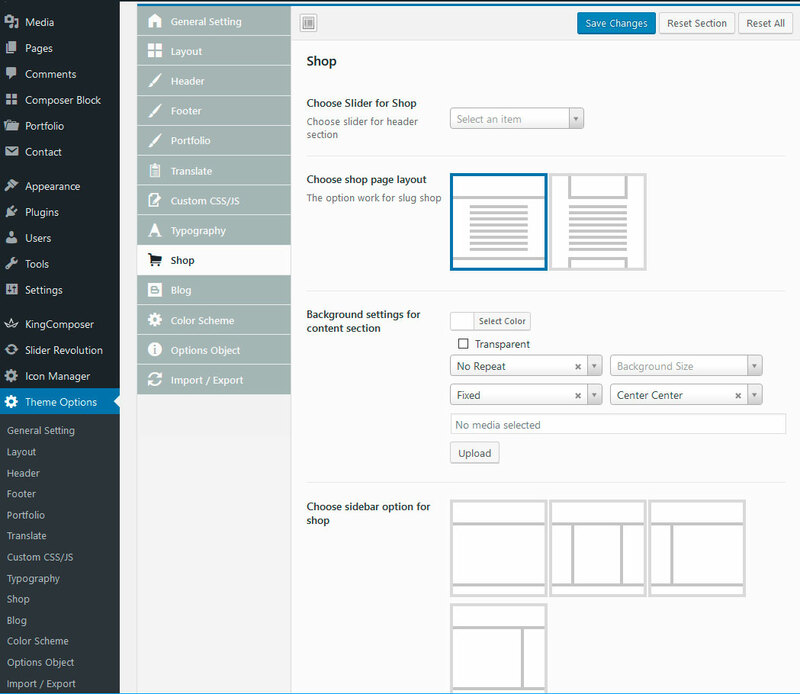 Select slider, background and sidebar options for your store. 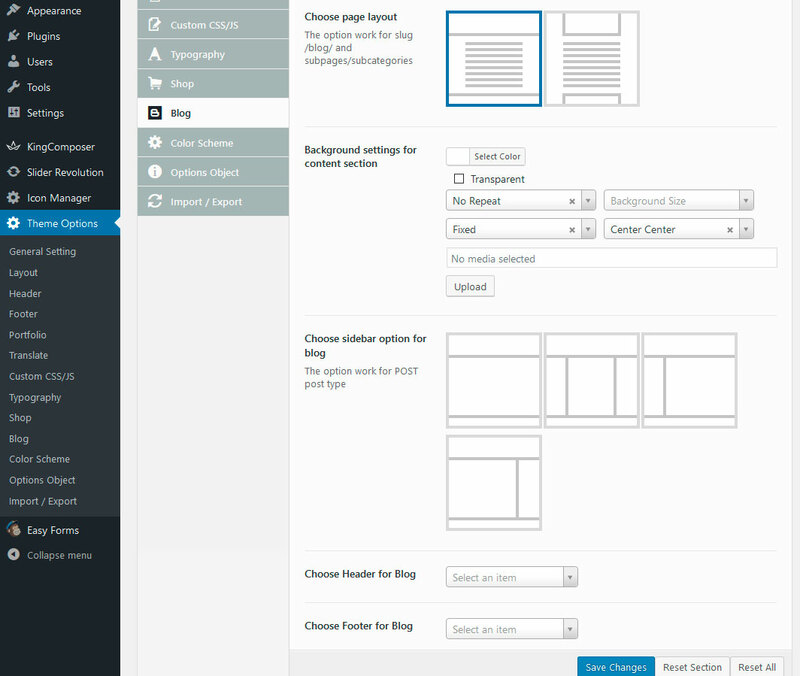 This is where you customize your blog display options. 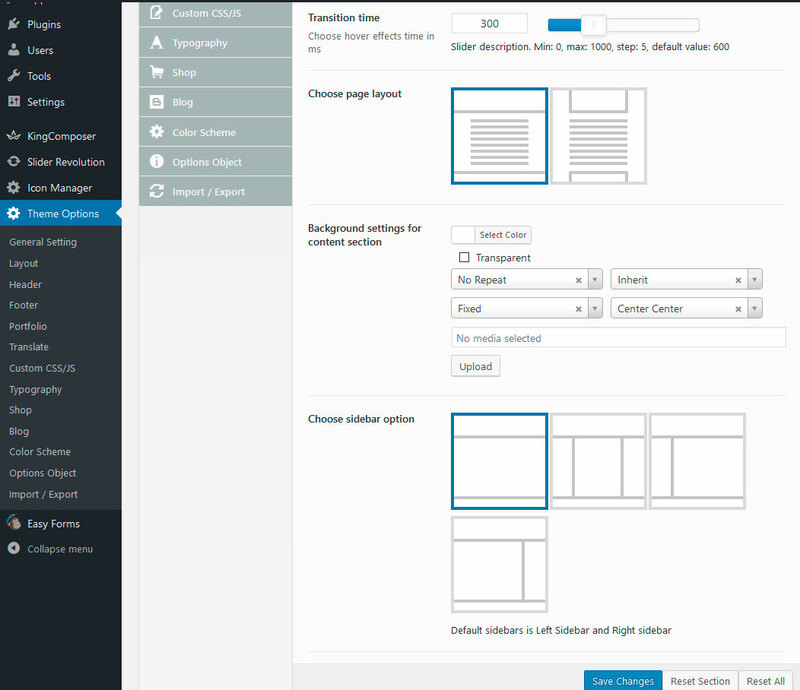 Select slider, page layout and sidebar options. 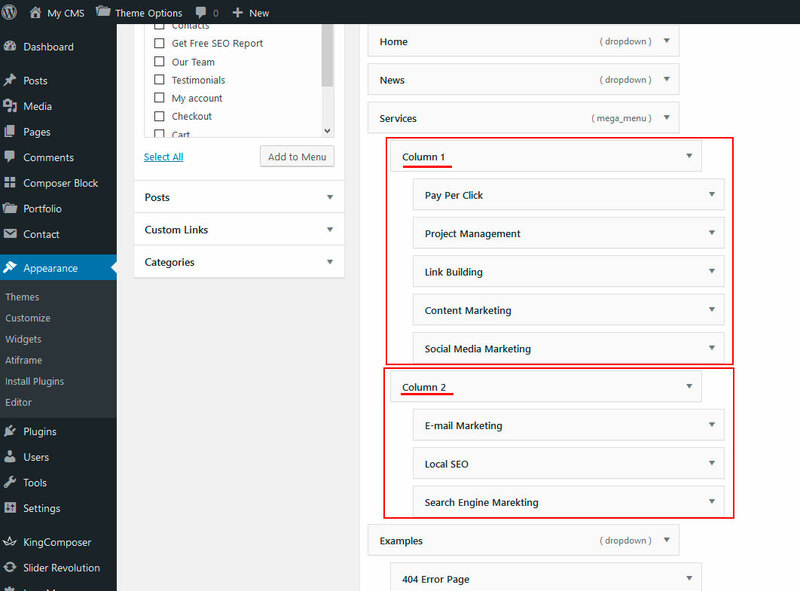 These options work for the Post post type, that include all categories and subcategories. 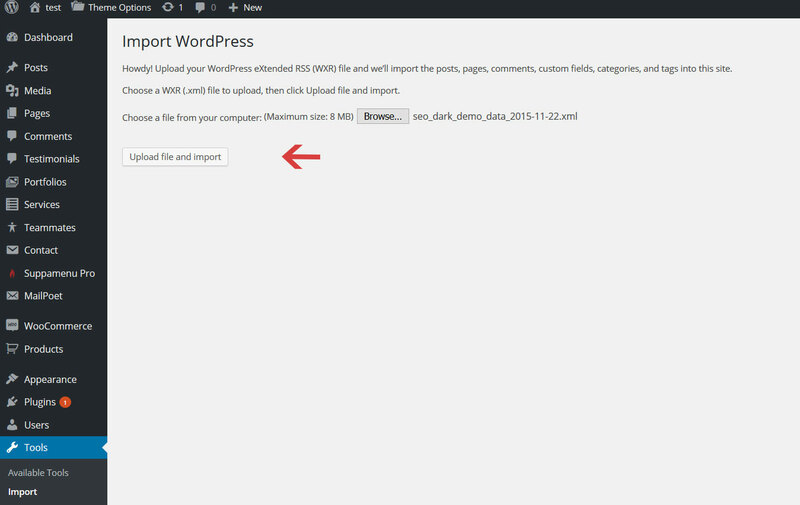 6) Upload these files to /language/ directory and set your language in Wordpress Settings. 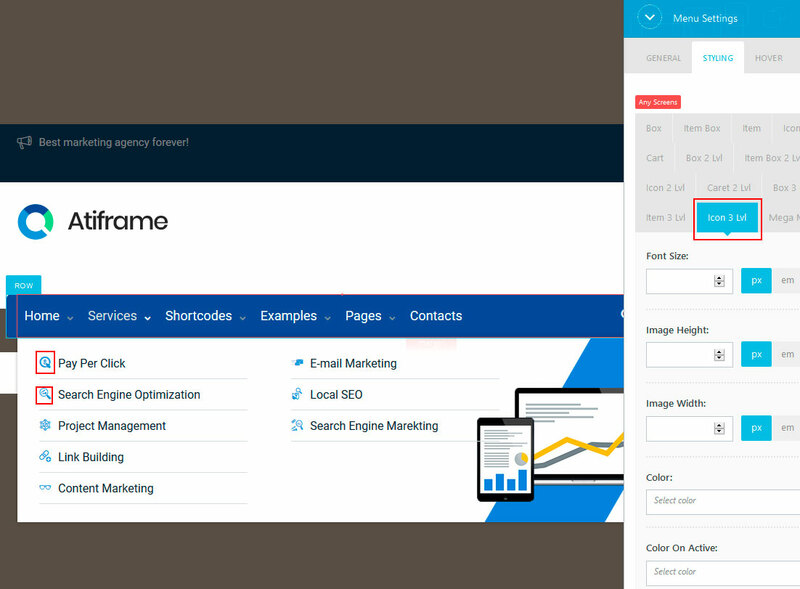 Sidebars: How Does Sidebar System Work? 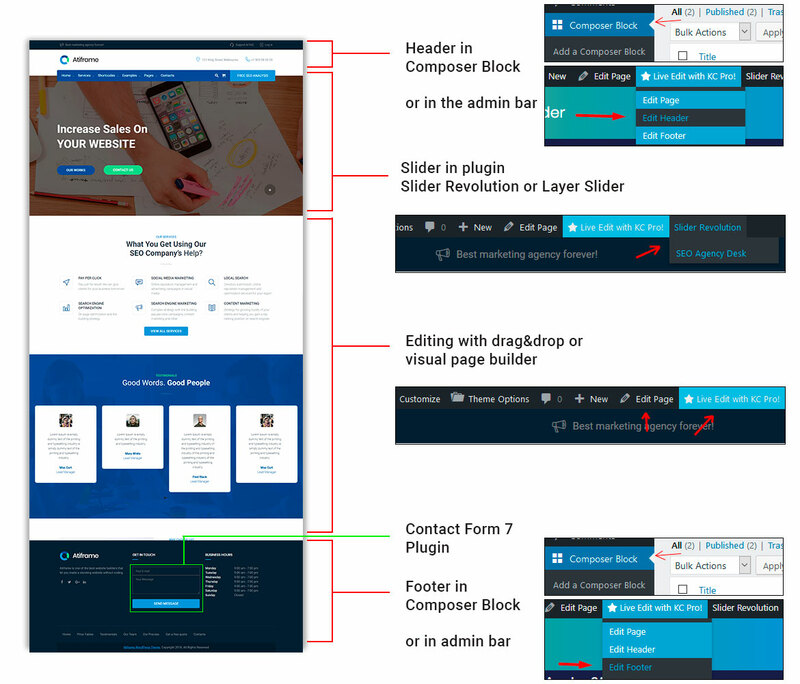 Best way ti create sidebar is a create Composer Block with type Widget and than set Composer Content Block widget to the sidebar. For Blog - Theme Options -> Blog. 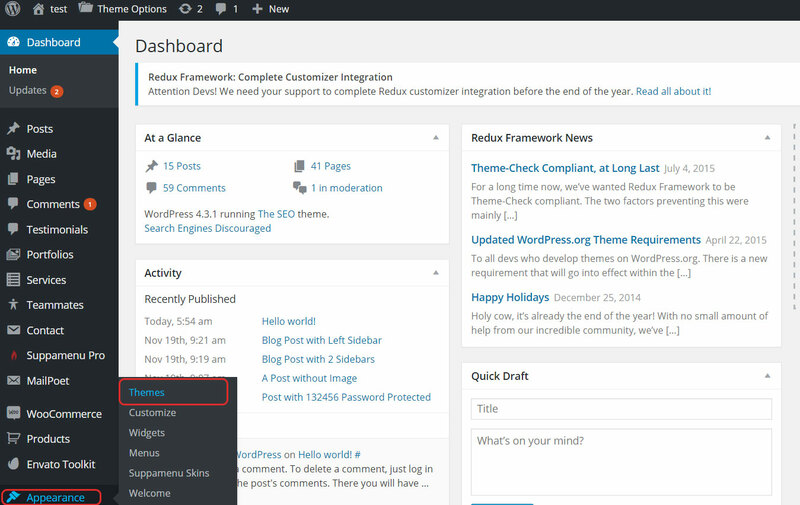 You can add necessary widgets in Appearance -> Widgets at Left Blog Sidebar and Right Blog Sidebar. 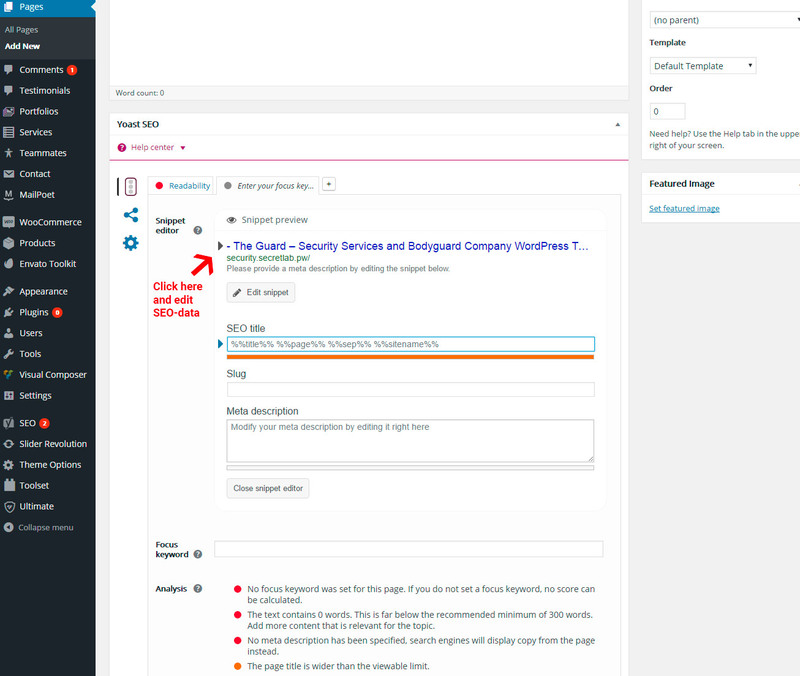 We recommend put all your blog's categories into Blog category with slug /blog/ for proper operation of blog's settings. Description of elemenets from SecretLab Shortcodes is here. 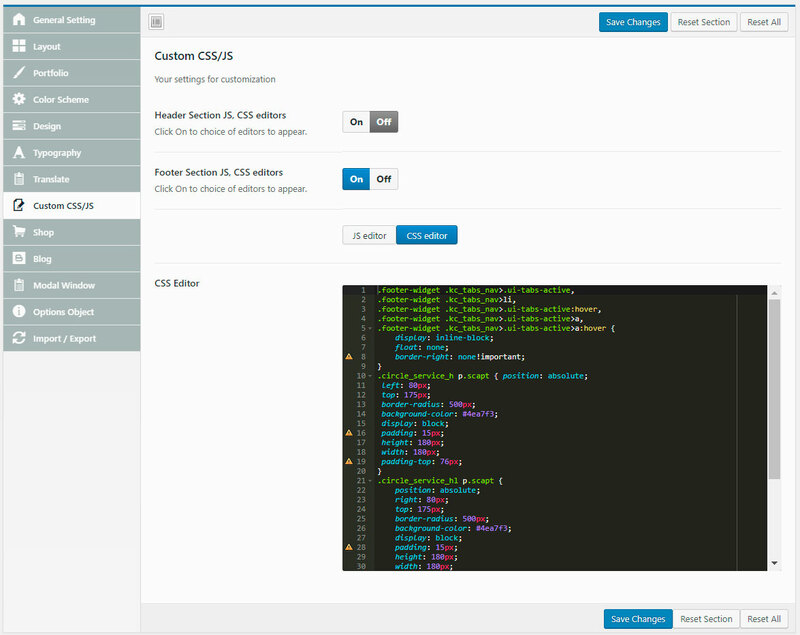 Displays an inscription on the background of a column or row with absolute positioning. 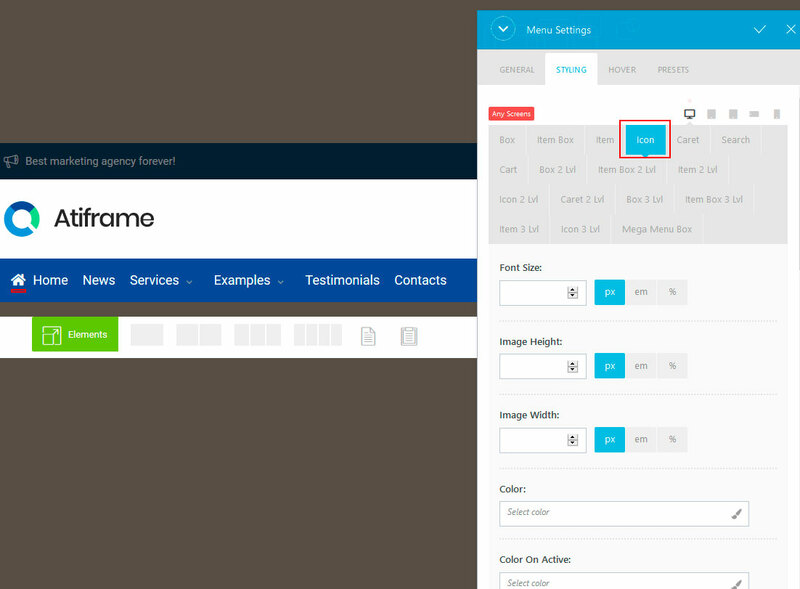 It is displayed in the lower layer, so sometimes it can be difficult to select this element with the mouse for editing, because it is under another element. 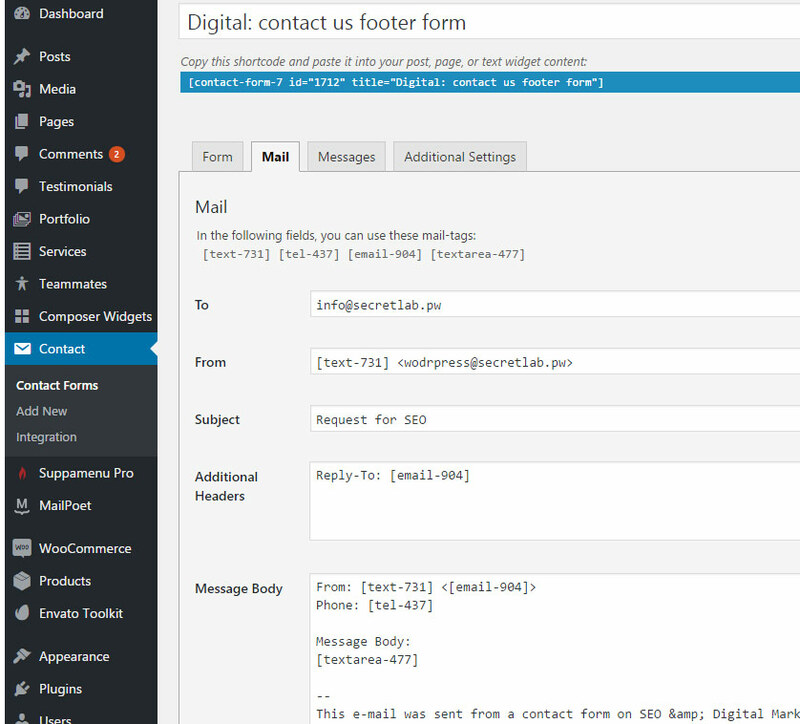 Displays feedback forms with unlimited design patterns and colors from the Contact Form 7 plugin. 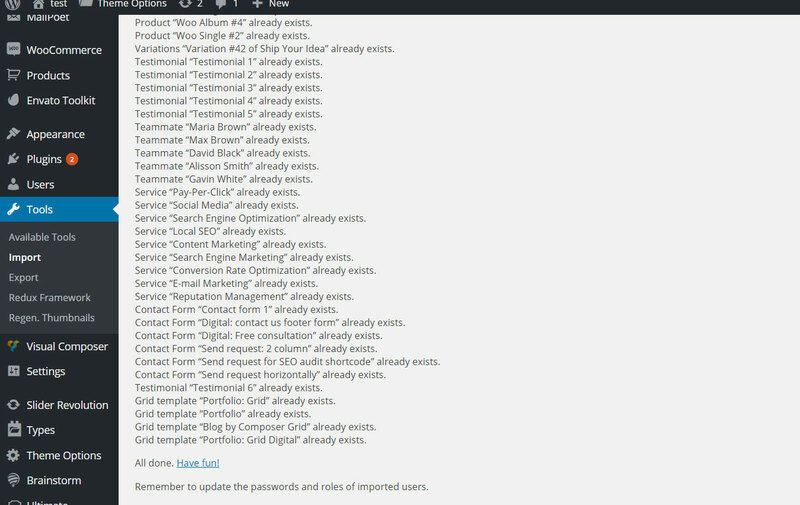 Required plugin Contact Form 7. 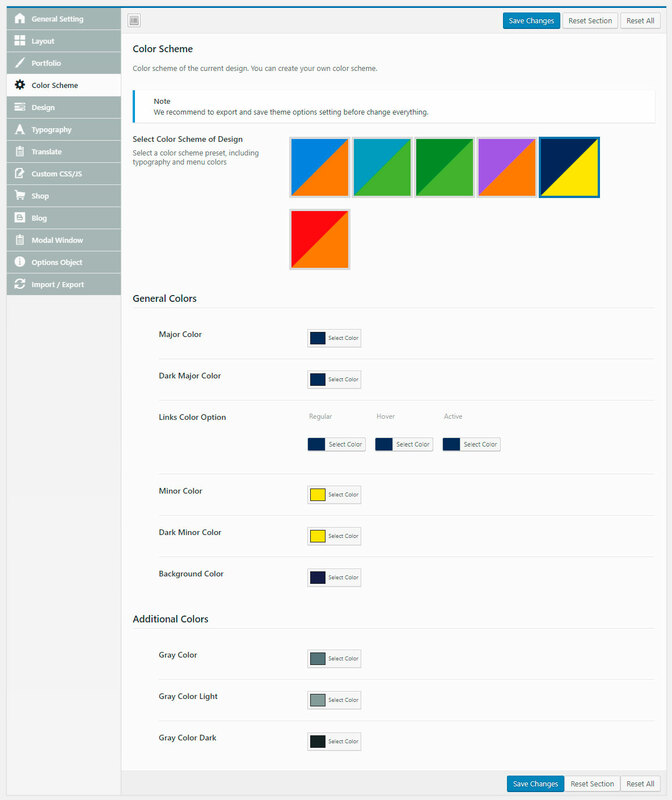 Displays an icon and description with unlimited design templates and colors. 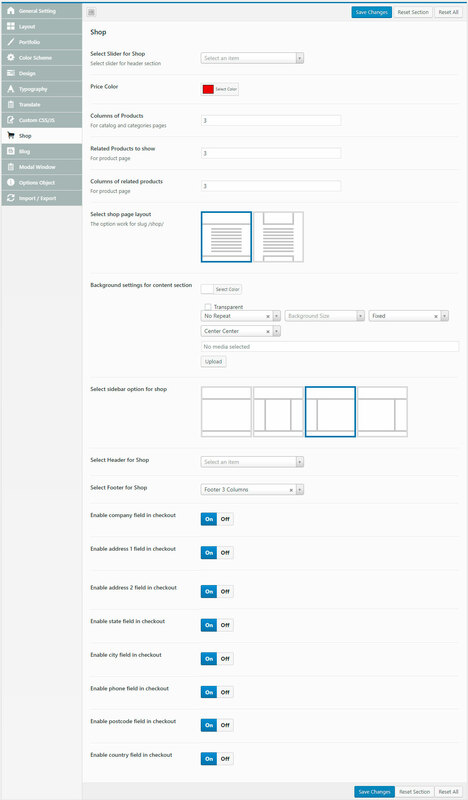 Displays forms from MailChimp for the Easy Forms for MailChimp plugin. 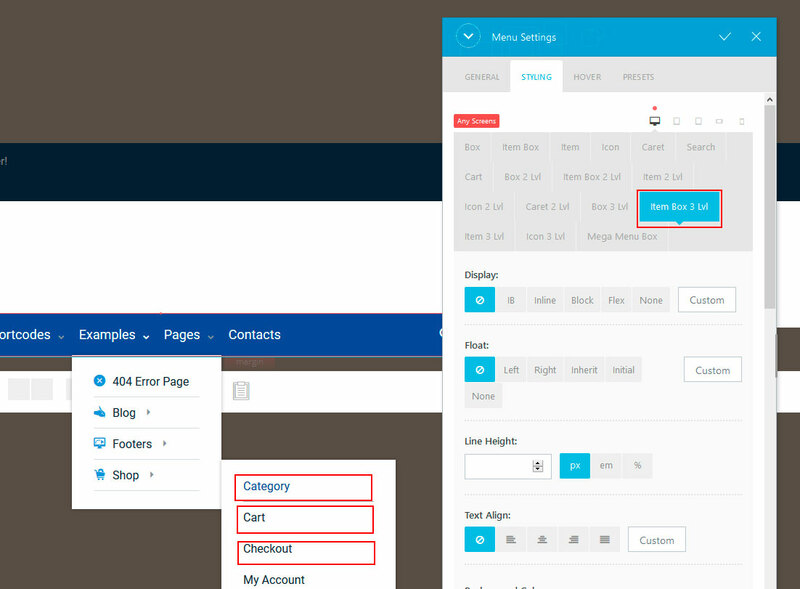 Required plugin Easy Forms for MailChimp. 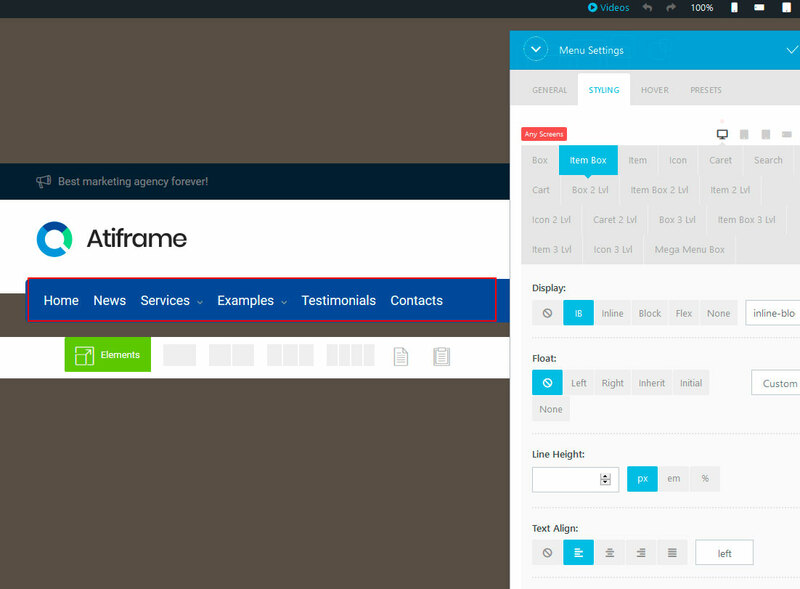 Displays posts of different types with unlimited design and color settings. 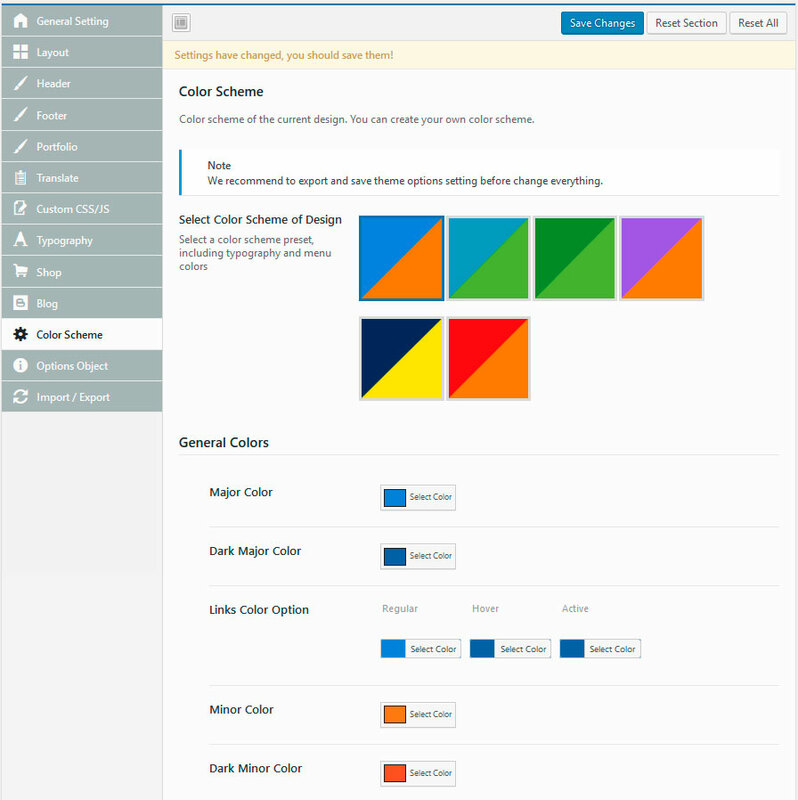 Displays menu unlimited design and color options. Displays a title from several parts with different tags and font and color settings. 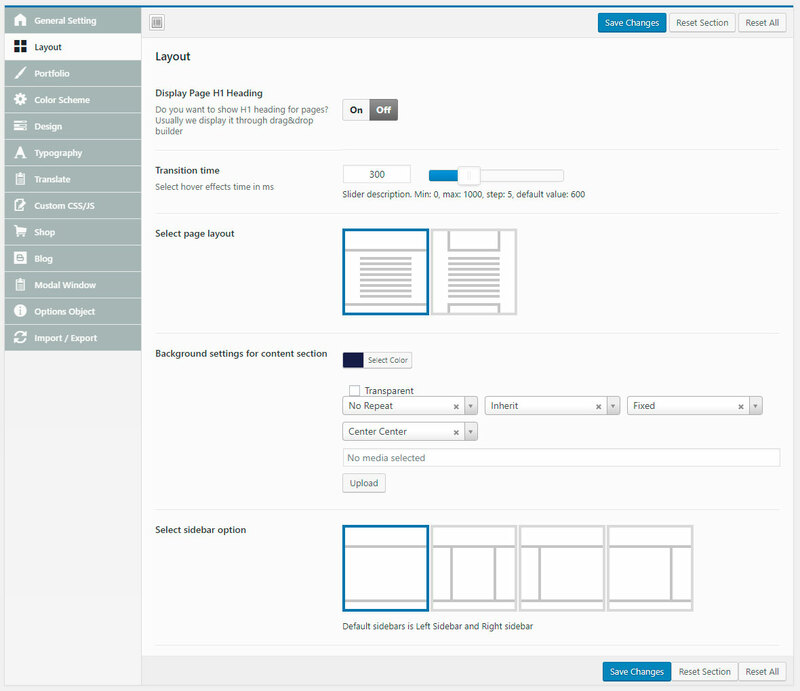 Displays a slider from Revolution Slider plugin. 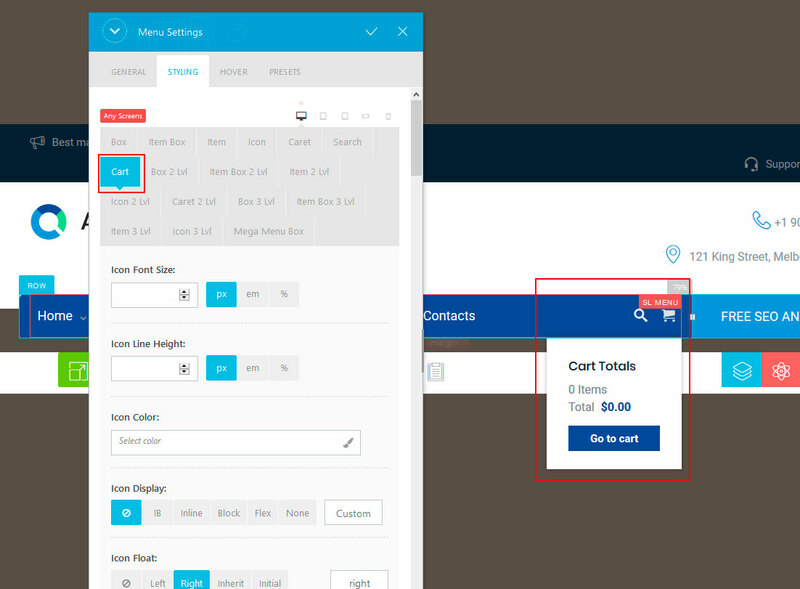 Displays a block with 5 icons and 1 description to show your advantages to you customers. A few design telmplates is available. 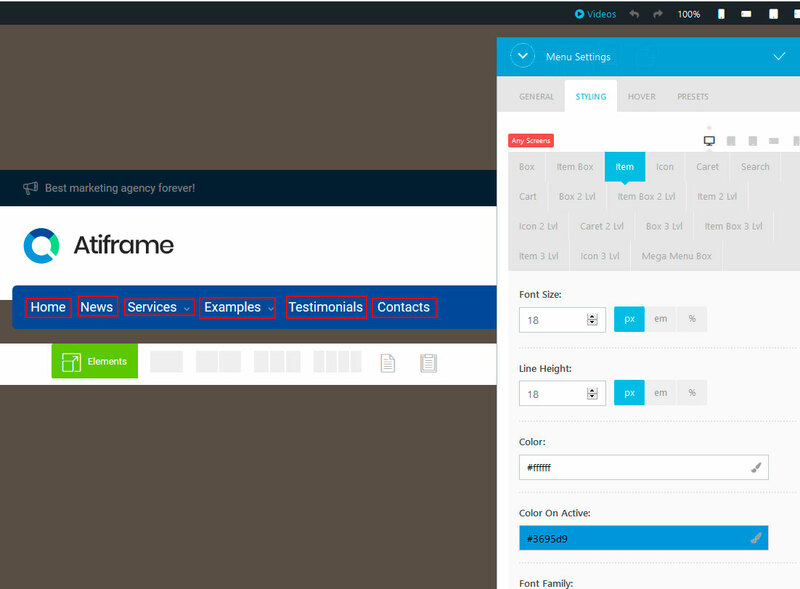 Displays a sidebar in any place. 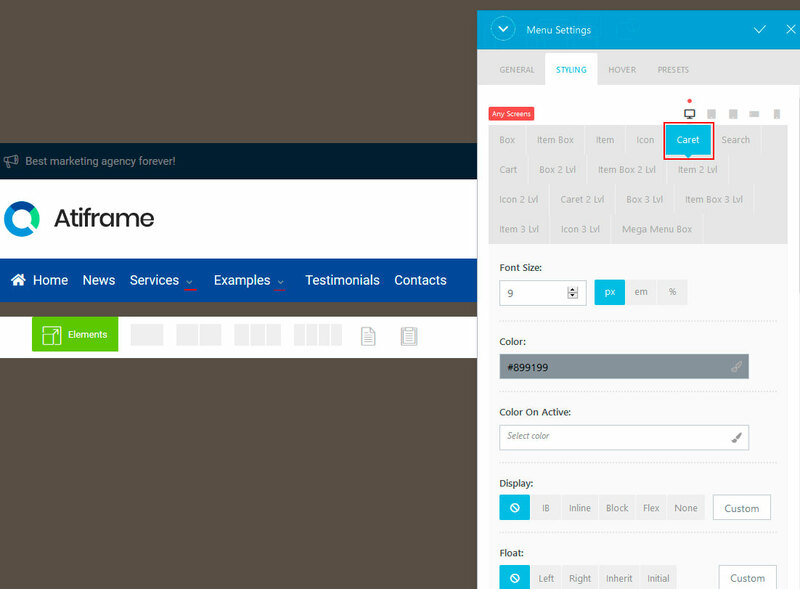 To display any of your menus from Appearance -> Menu , you can use our Menu element for King Composer. 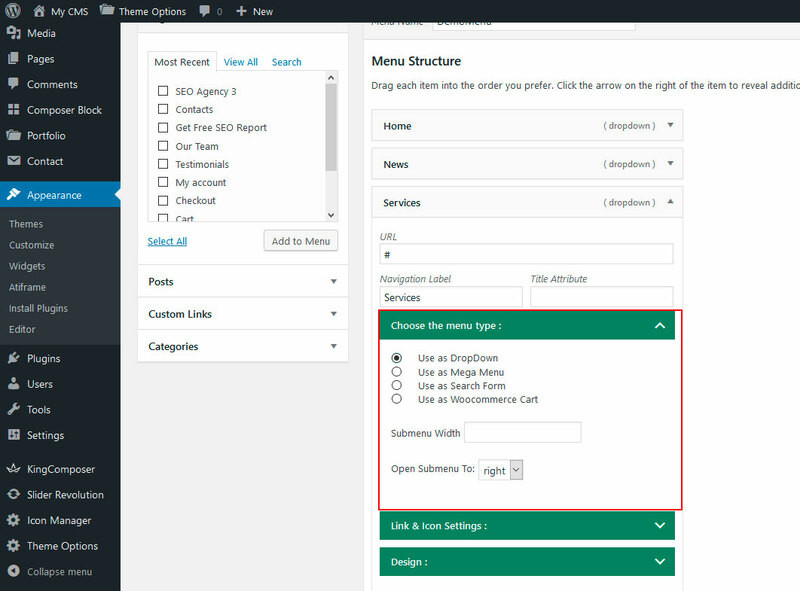 The menu item type settings are located in the Choose the menu type: . 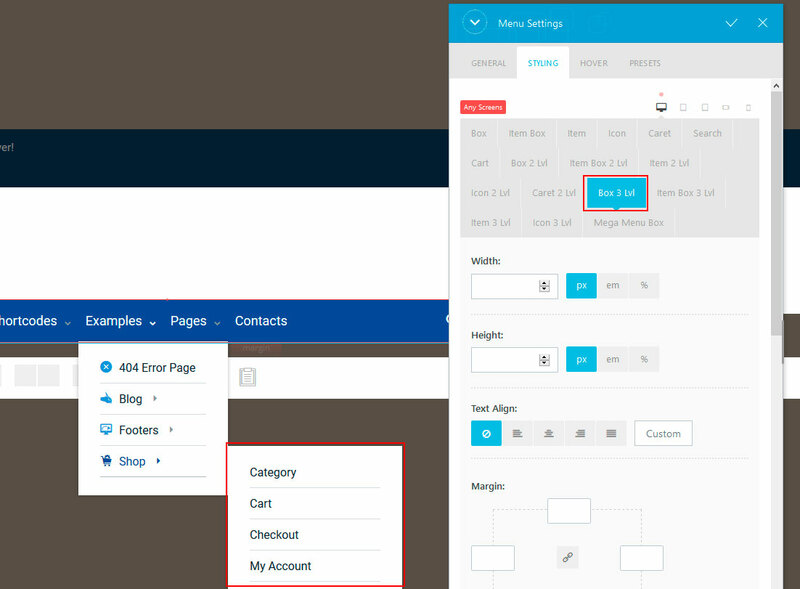 Use as Woocommerce Cart - a shopping cart block of a Woocommerce store with the amount, quantity of goods and a link to the order page. The theme is supplied with icon font set: Native icon set that contacin ~1000 icons. You can find zip archives with the icon sets at Icon fonts folder. Icon Manager support upload icon fonts, that was prepared at Iconmoon App. 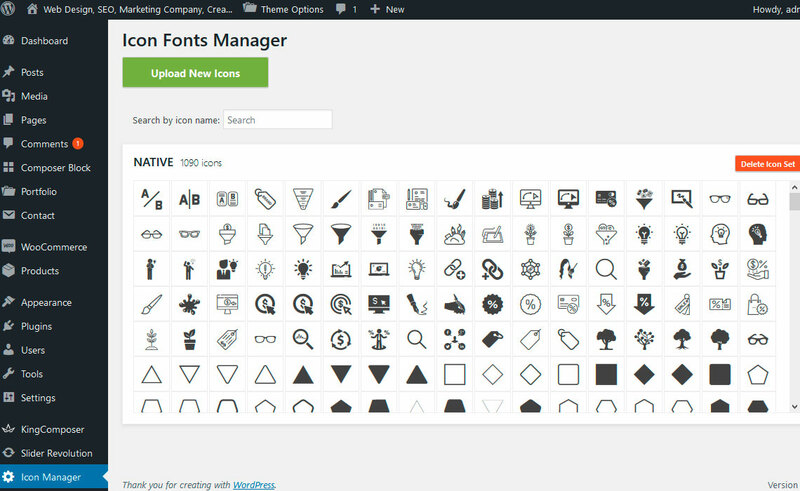 You can create icon font and upload .zip archive to Icon manager to use icons for display through King Composer. 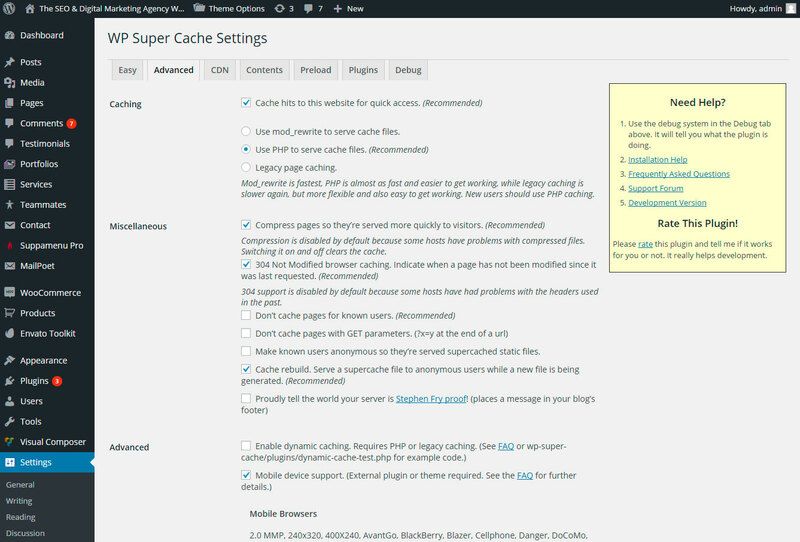 Best result of site load speed optimization displays by W3 Total Cache plugin. 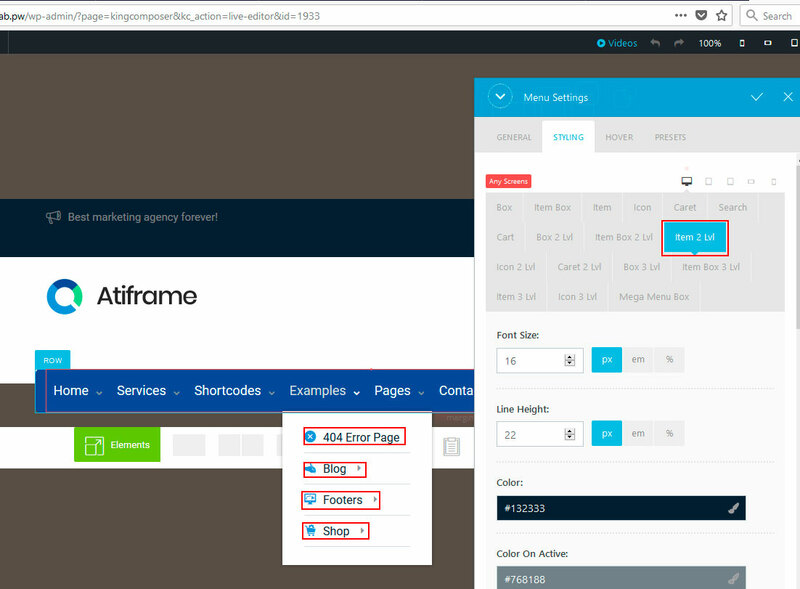 Sometimes we used W3 Total Cache + Cloudflare or King Composer's Cache + Cloudflare, but it displays not so high speed of page loading, but more points in website speed test services like https://gtmetrix.com or https://www.webpagetest.org or https://tools.pingdom.com. But these services are out of date a little bit. Because now you can use HTTP/2 protocol that let your website loads faster, because unlimited files can loads in parallel mode, instead of classic HTTP protocol, when files loads consistently. Information below is out of date if you are using HTTPS and HTTP/2 protocols. 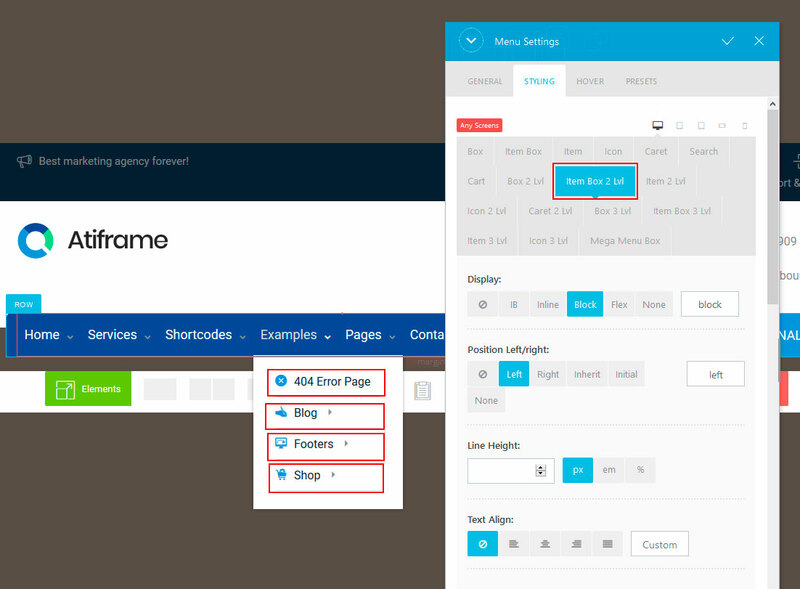 These 2 easy steps let you increase page load speed. Cloudflare and King Composer Cache displays good result of page load speed optiomization. 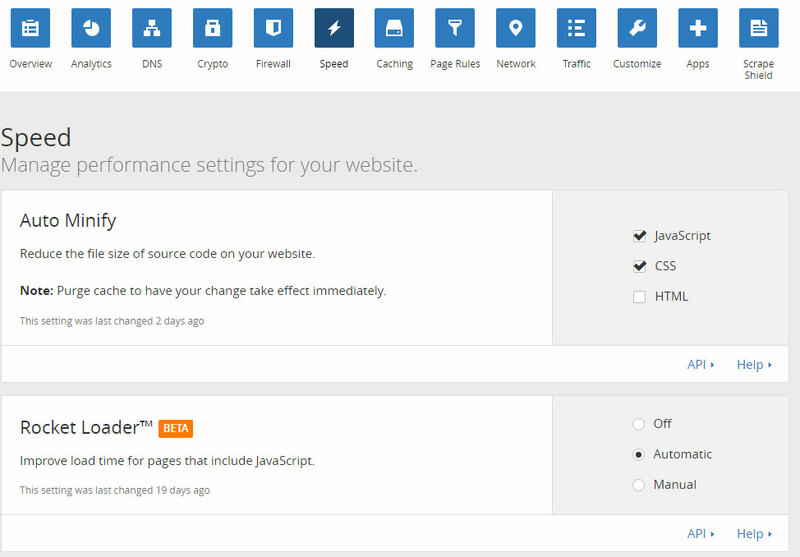 King Composer is the main plugin for content building. The header and footer of the site can also be edited with King Composer in the Composer Block . 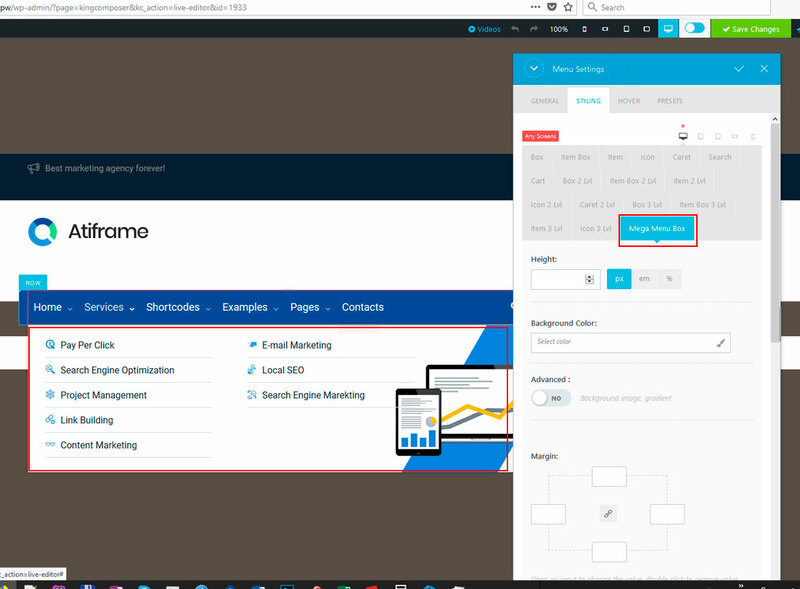 At the moment we are preparing a video tutorial on working with the page builder, but if you have questions, do not hesitate to ask us in our support panel - this will help us make more convenient and useful lessons. King Composer contains an administrator's editor, available by clicking on the blue button (circled in red on the screenshot) and a live editor available by clicking on the green button or the blue button on the top panel (buttons in the screenshot without a red frame). 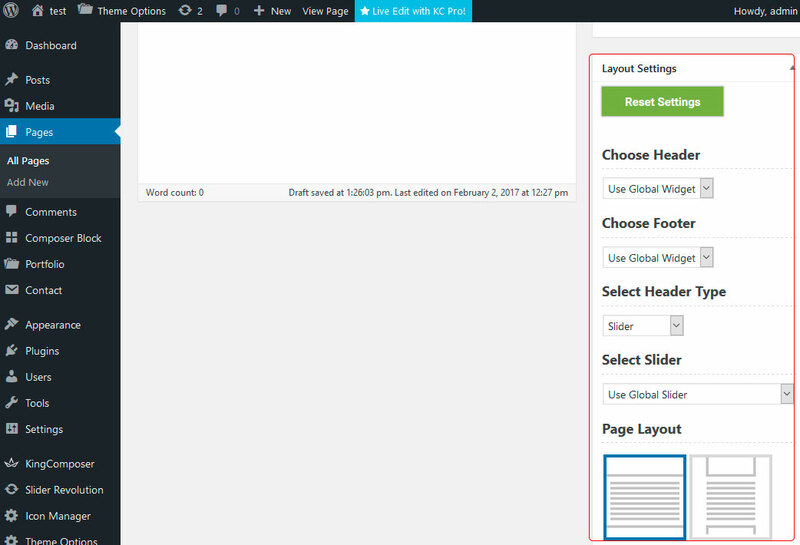 choose a slider or image to display in the header of the page. 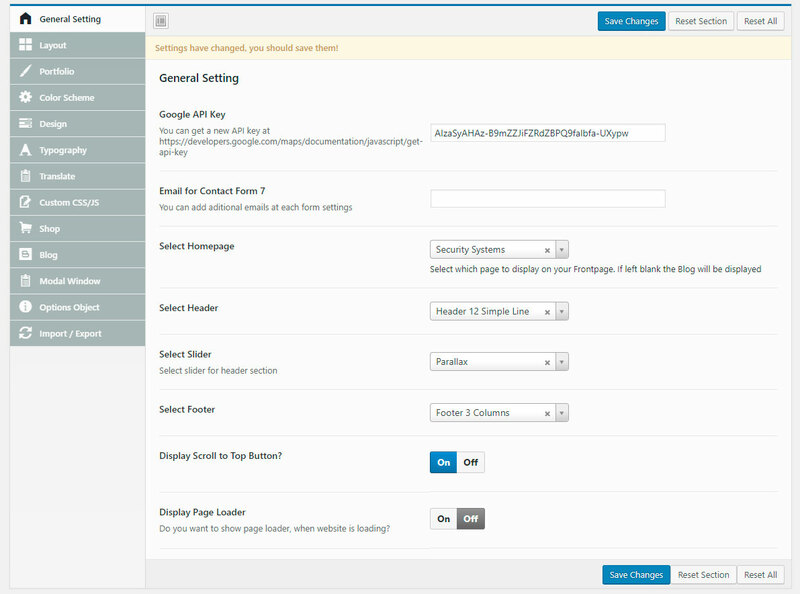 You can set footer and header that you want to display on Theme Options -> General Settings. 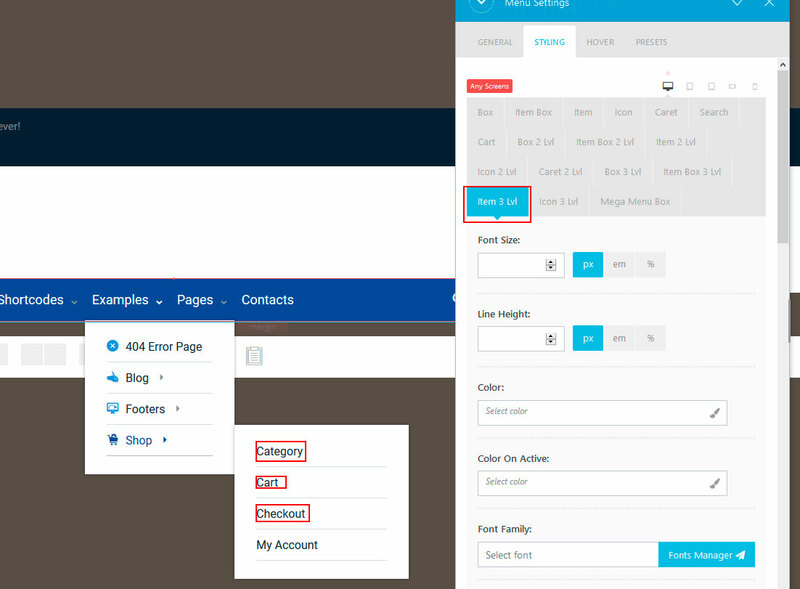 Individual header and footer for any page you can set in right setion Page Layout. 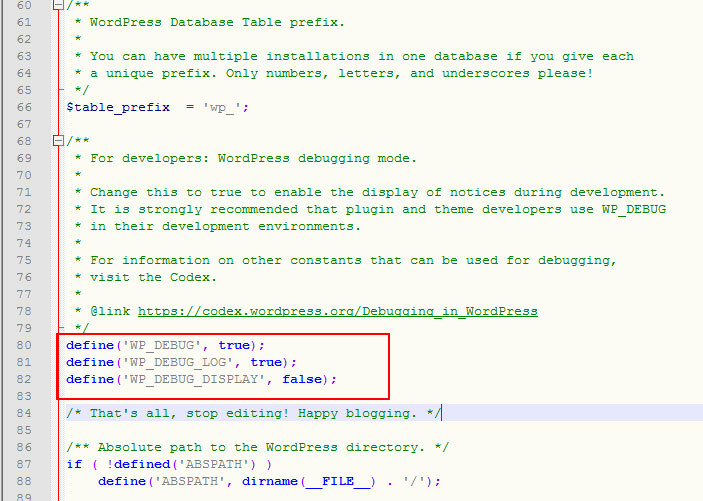 It is better to initially install WordPress on a domain with HTTPS, but if you did not, then you need to switch from the old version of HTTP correctly. 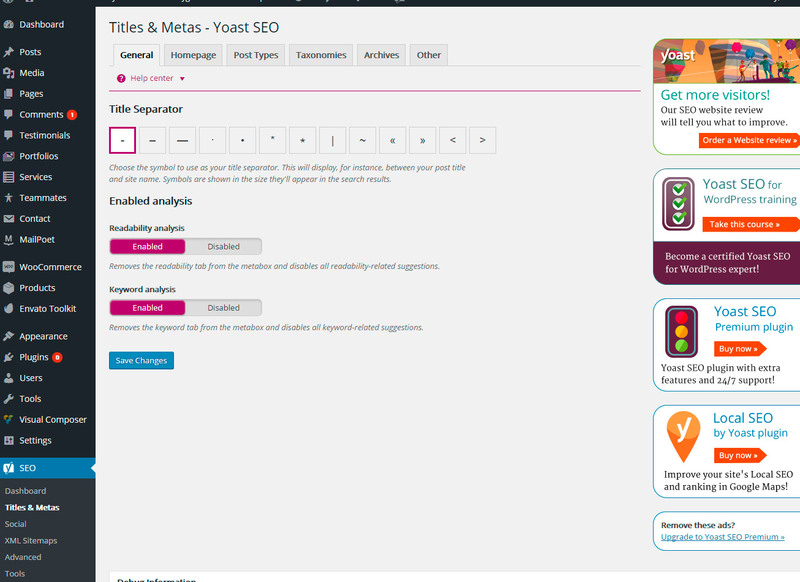 You can configure Breadcrumbs and Permalins at SEO -> Advanced page. 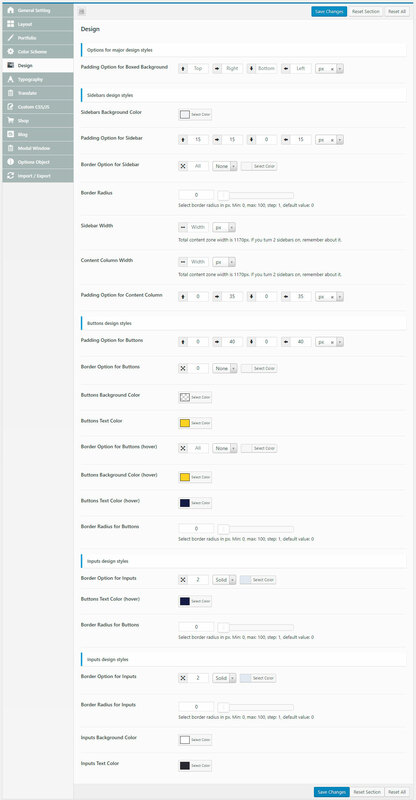 You should add the key to Theme Options -> General Settings tab.